Like To Laugh? 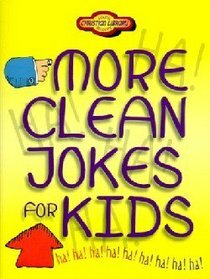 Then you'll love More Clean Jokes For Kids, the funniest, goofiest, silliest, overall best collection of clean jokes you'll find under one cover. And you can tell them to anyone...even your grandma! Inside these pages, you'll meet the happiest animal in the wild (the "happypotamus"), learn what happens to mufflers when they grow old (they feel exhausted), and find out who's married to Antarctica (that would be Uncle Arctica, of course!) Like to laugh? Then tickle your funny bone with More Clean Jokes For Kids! - Publisher A rib-tickling collection of silly jokes, snappy one-liners, tantalizing tongue-twisters, and goofy knock-knocks. Compiled by Dan Harmon and Tamela Hancock Murray. About "More Clean Jokes For Kids (Young Readers Series)"
A rib-tickling collection of silly jokes, snappy one-liners, tantalizing tongue-twisters, and goofy knock-knocks. Compiled by Dan Harmon and Tamela Hancock Murray. Dan Harmon, author of Men of the Bible, resides in Spartanburg, South Carolina.